My friends and I have talked about Leni Robredo since the time she rose to national fame after the death in 2012 of her husband, the late Interior Secretary Jesse Robredo. For the next couple of years, she established a reputation for having a modest lifestyle. 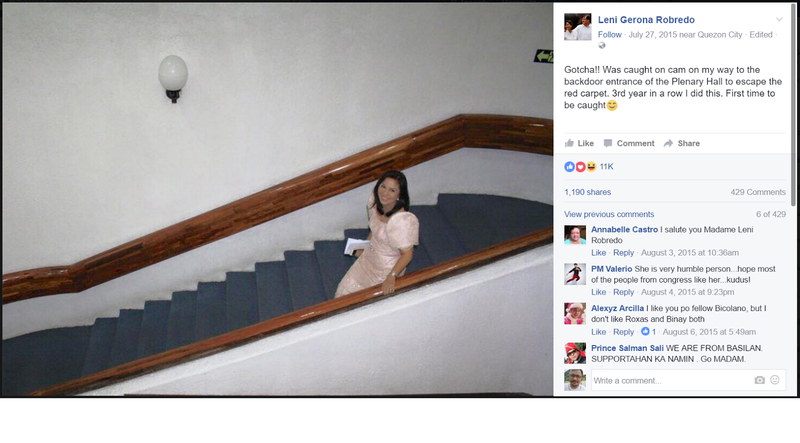 Do you still remember the time when she ditched the SONA Red Carpet and used the Batasan Pambansa backdoor entrance instead? Yes, she's the simple and meek widow that is Leni Robredo. For years, I had a positive opinion of her. That is, until I started my blog ThinkingPinoy, until I started looking harder into what have transpired in the past several years. I started having suspicions about Leni’s qualifications as a government official when I first heard the rumor that she flunked her bar exams, a rumor that was later verified when Leni admitted it herself [Inq]. While failing the bar is not the end of the world, I was never able to wrap my head around the idea that someone who aspires to be the second most powerful person in the Philippines is not the sharpest tool in the shed. When I chat with friends, I often explain my position on that matter by using an analogy. Then I ask, "And what if that legislator wanted to be vice-president?" Yup, there’s something wrong somewhere in this equation. Yes, I started to have my doubts about the Leni Robredo as painted by the media, so I revisited the SONA Red Carpet Incident that basically transformed a simple widow into a national symbol of humility. Leni used the backdoor entrance to avoid the attention usually accorded to politicians and celebrities attending the annual State of the Nation address. 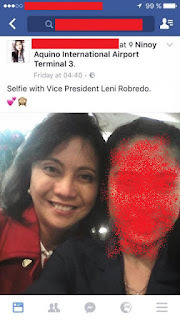 I can only surmise that Leni didn’t like the attention, the pomp, and the pageantry, and that she attended the SONA with a sincere objective of being the representative of the People and nothing more. 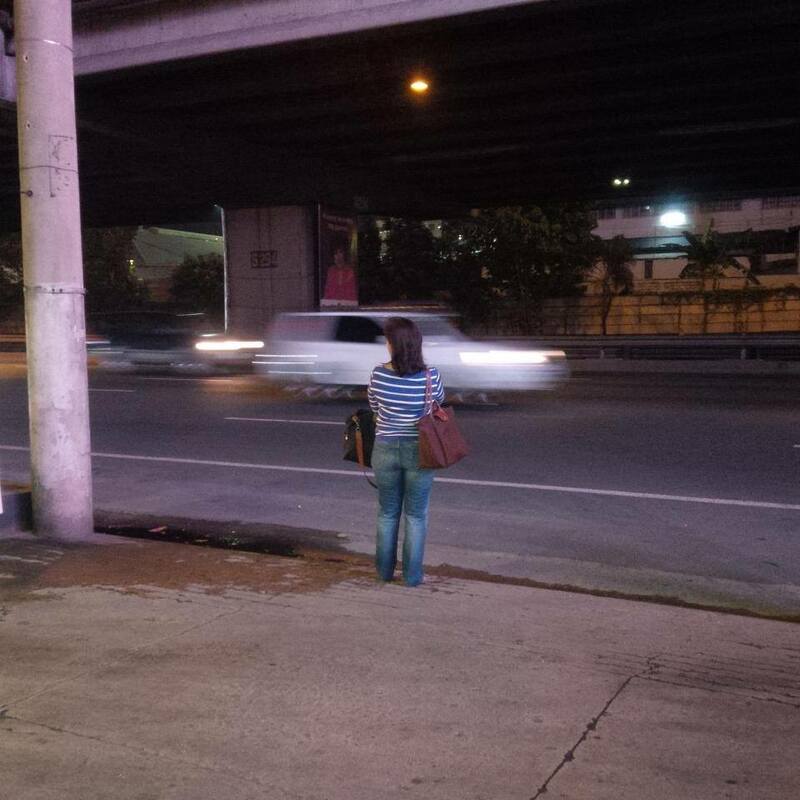 She purportedly didn’t like the attention, but she publicized a photo of the incident herself [FB]. Hates the attention, then craved for the attention? Robredo’s own office bragged about her humility. Wow! that’s so humble of her. Oh, and do you remember the viral 2014 Leni-taking-a-bus PR stunt? As it turns out, this Keisha del Castillo is not only Robredo’s friend, but also her long-time staffer. Based on her [LinkedIn] account, del Castillo was Leni’s “Head Executive Assistant” at the time the photo was taken. She then became Robredo’s Chief of Staff and eventually, the head of Private and Ceremonial Affairs Office under the Office of the Vice-president. In short, Robredo’s own office bragged again about her humility, even going as far as creating a video about it two years later, for use as 2016 campaign material. And do you still remember the Liberal Party’s campaign planes? For someone who allegedly espouses good governance, I cannot, for the life of me, understand how she could stomach riding Roxas’s campaign planes when they were owned and funded by illegal miner Eric Guttierez, the same illegal miner who cheated on his taxes, destroyed an entire town, and terrorized its townsfolk [TP: Campaign Planes]. But I am a political realist, so I have resigned myself to the idea that every politician lies and cheats… and the only thing that varies is the degree in which they do it. Thus, until election election day, Robredo was my Number 2 pick. That is, if my primary bet Alan Peter Cayetano loses, I sincerely wished that she win instead. And she won, and she got worse. 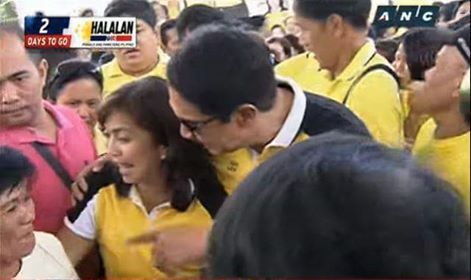 Leni managed to raise my eyebrows when I found out that she spent P418 million during the 2016 campaign, or about 30% more than the second-biggest VP spender Chiz Escudero [CNN]. And where did she get the money? She said she got it from “creative” volunteers, including a Lugawan [ABS]. That’s one hell of lugaw vendor if you ask me. From that ABS-CBN report, it appears that she has a very good idea as to where her campaign money came from, yet she still failed to file her Statements of Campaign Expenditures on time. To make matters worse, she even cited an obsolete Comelec resolution to justify the tardiness [TP: SOCE]. Yes, here’s a lawyer who doesn’t know the laws that apply to her. But it still gets worse. Then came the Le-Knee incident, where she blasted the President for commenting about her knees. “Tasteless remarks and inappropriate advances against women should have no place in our society. We should expect that most of all from our leaders,” Robredo told [CNN] a day after the November incident. Yes, the humble and meek widow has metamorphosed into Our Lady of Naga. But what I still fail to understand is how Leni could find a joke about knees anti-woman, when she finds physical contact with a married man acceptable? The man closest to her at the moment, Quezon City Representative Bolet Banal, is married. There’s a word for it: Hypocrisy. Just three weeks into the vice-presidency, Robredo started to decry extrajudicial killings allegedly committed by the Duterte Administration [Star]. She yakked about it month after month, and she still yaks about it up to this day [CNN]. Five months have passed since she first mentioned EJKs, yet she still fails to provide even an iota of evidence showing that these killings were state-sponsored. It has been ten days since Duterte unleashed that dare, yet Leni has yet to respond. 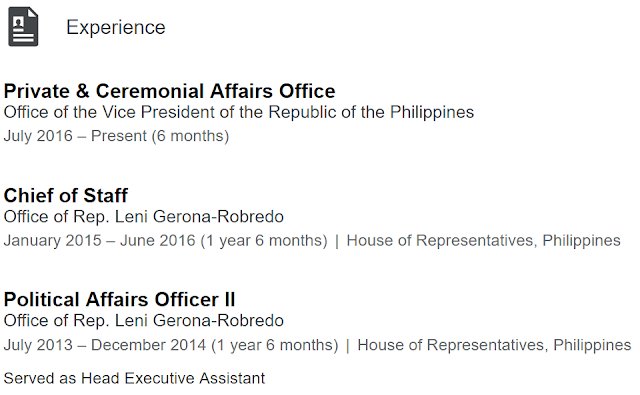 After her much-publicized resignation from the Duterte Cabinet, many of her critics (and there are lots of them) see Robredo as a NATO leader. It’s a colloquial acronym for “No Action, Talk Only”. Because a closer look at her purported achievements shows that it's mostly made up of meetings, conferences, paperwork, and little else. Even the implementing rules and regulations of a small section of a 1992 Republic Act took her five months to draft [CNN]. Yes, it appears that Robredo suffers from the same illness Roxas had: Analysis Paralysis [IBTimes]. But then, there still was a small part of me that wanted to give her the benefit of the doubt. After all, she’s been in office of just five months. Leni just had to have the right opportunity to show her capacity for action. And that opportunity came. And the opportunity’s name is Nina. Nina and the "Mother of the Nation"
On 22 December 2016, [GMA] reported that Typhoon Nina (International Name: Nock-ten) was about to hit the Philippines, and that it was expected to make landfall on the Bicol Region – Leni’s own bailiwick – on Christmas Day. According to the report, Nina was anticipated to become a Category 3 Hurricane. By 23 December 2016 (Manila), NASA’s Aqua Satellite showed Nina has intensified [Phys]. In preparation, the Duterte Government has evacuated hundreds of thousands of Bicolanos to safer areas. The National Disaster Risk Reduction and Management Council (NDRRMC) is on heightened alert, while Social Welfare Sec. Judy Taguiwalo has activated response clusters to ensure close coordination and quick mobilization of assistance for communities likely to be affected by the typhoon [Star]. Yes, even on Christmas Day, the Duterte Government is at work: no vacations, no days off, no R and R... while Leni did the exact opposite. Despite all that’s happening, Robredo still decided to leave the country for a US vacation. Take a look at the following image taken at NAIA at 4:40 PM Friday, 23 December 2016. This is the problem when a politician conducts too many press conferences: people notice bouts of deafening silence. No, the US-bound flight was not part of an official trip, as Robredo’s official trips are very well-publicized ahead of time. This is a personal trip that Robredo herself knows is ill-timed. This woman, my friends, is part of the group that calls for Duterte's resignation, the same group who's plotting his ouster [TP: Plan 0117]. The same woman who will become President should that call be heeded. The same woman who loves to contradict herself. 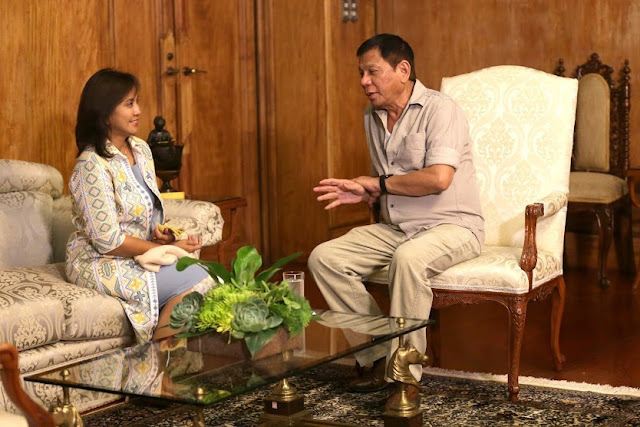 Now, Robredo herself said “it is very important for local folks to see their government officials during and right after a disaster”. Straight from the horse’s mouth, and where was she while Nina was pummeling her hometown in Bicol? Vacationing in the United States. Leni left the Philippines last Friday knowing full well that she’s badly needed by Bicolandia. She left despite her full knowledge that she must stay.